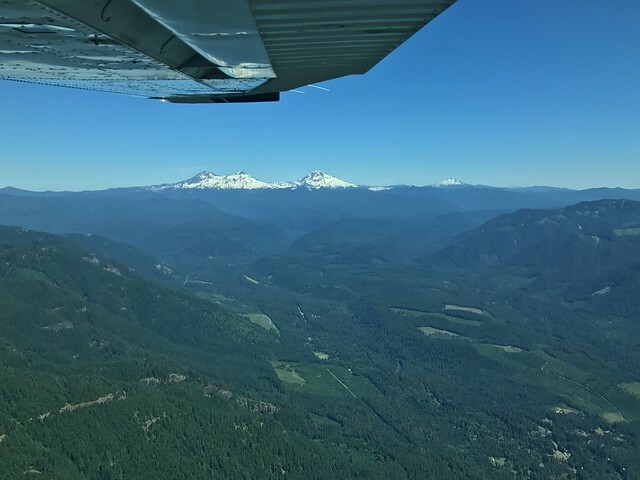 Above: View over the Willamette NF from a Cessna 182, looking at the Three Sisters. Late June, 2017. As is becoming my “norm” for this year, I’ve spent the past month or so too busy to really spend the time I should on writing, or more accurately, thinking about writing and what I want to write in particular. I’ve had plenty of ideas and inspiration, but I just haven’t had the time to follow through on most of them. If I’m being completely honest, even in my free time in the evenings and weekends, I’m usually zoning out, or practicing my wicked-sharp self-distraction skills… not a productive use of the time by any measure. The new job has kept me busy, pulling me in a lot of different directions, and making me think long and hard about what I want out of life and work. Of particular difficulty was the decision to accept the position permanently when they offered it to me early in the month… For various reasons that I might write about in the future, it was a strangely difficult process to accept a promotion and move to Oregon. But I did in fact accept the job offer, and I’m about three weeks away from making the move from Boise to Corvallis, from the edge of the mountains on the Snake River plain to the western edge of the Willamette Valley, mere miles from the Pacific Ocean. It’ll be an interesting and challenging move, and summer as I learn the ins and outs of the new job, but after I came to peace with my somewhat rocky decision-making process, I’m feeling pretty good about what the future holds. As much as I like parts of living and working in Boise, I think I was due for a change of pace if not scenery. Above: View looking along the Pacific toward Newport, OR from Yaquina Head. In other news… as I said, it’s been a busy month. Shortly after writing my last blog entry I took a Sunday road trip to clear my head a bit, and did the loop out to Tillamook, down the 101 Highway to Newport, over to Corvallis, and then back up I-5 (which I’m learning to hate, in case anyone was curious) to the outskirts of Portland. 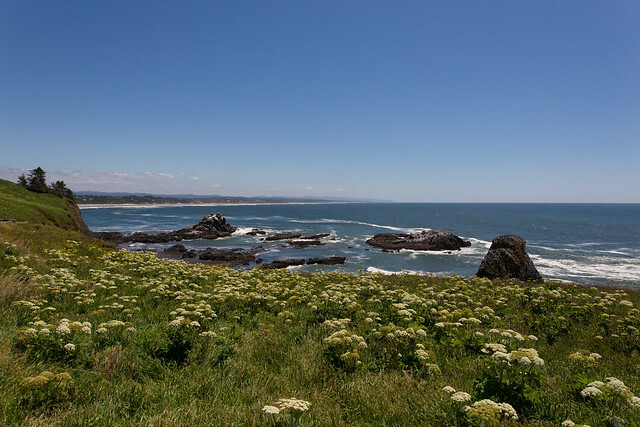 I stopped at a few beaches along the way, as well as the Yaquina Head lighthouse, where I not only saw the lighthouse, but a few whales in the distance as well. Not shabby for a spur of the moment Sunday drive. 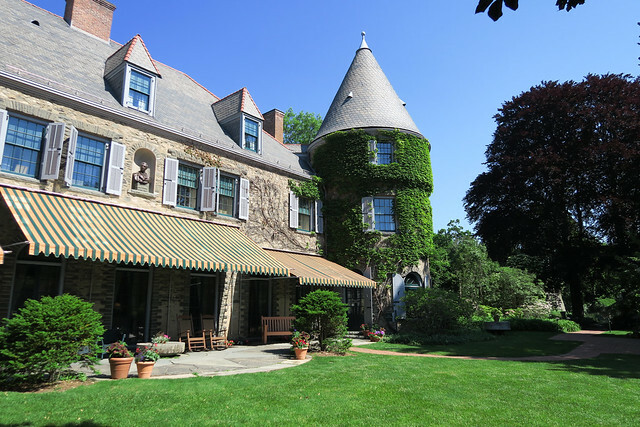 Above: Part of the Grey Towers Historic Site, Milford, PA.
Not long after that I headed back East, to Milford, PA, site of Grey Towers, the USFS National Historic Site that was in previous years the summer mansion of the Pinchot family. For those who aren’t keen on Forest Service or Forestry history, Gifford Pinchot is considered the father of American Forestry, introducing the practice to American lands in the late 1800s, and founding the US Forest Service as we know it today. In the larger scheme of American environmentalism, he was of the same generation as Teddy Roosevelt and John Muir, and had a rather large role in creating many of the public land reserves – forests primarily – that we have today. I was there with a group of about 26 Forest Service folks for a leadership class and meeting, and I have to say that while it was pretty humbling to be able to visit a historic site, it was also a reminder that many of the “movers and shakers” of that era, no matter how noble their cause, were also incredibly privileged, with wealth and status that even today remain almost unheard of for the majority of people who live near, or work managing, public lands. 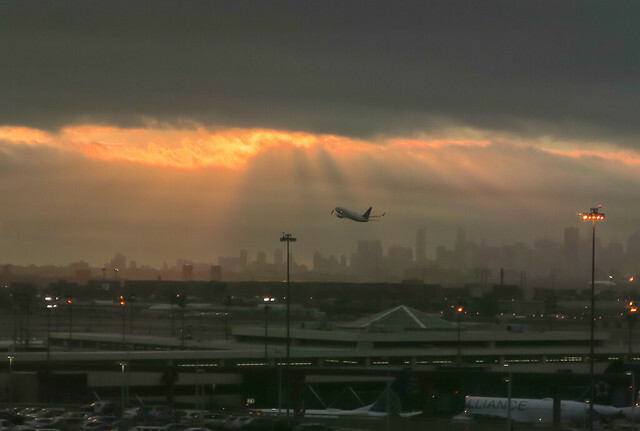 Above: Passenger jet taking off from Newark Airport, NJ. On a lighter note, the trip was chock-full of interesting and amusing little things. I flew in and out of Newark, NJ, and immediately understood why a coworker had told me he hated flying in and out of there, and I have to say I share the sentiment. On our drive out to Milford from Newark, we passed Air Force One sitting on the tarmac, which was rather neat in a silly way. One the other folks flying in later that evening said his flight was forced to circle out of the way for 20 minutes or so as the President departed after a weekend of golfing (I’m assuming) at his property in NJ. As someone who’s main exposure to New Jersey has been from sitcoms, mobster movies, and meeting a few brash folks from Jersey out and about in other parts of the US, I was pleasantly surprised by how rural it felt once we got farther out toward Milford. Now, I don’t mean to say it was rural by western standards, but it was definitely quieter and greener than I’d expected. Also unexpected was a view of NJ’s highest point from my hotel room on the PA side of the Delaware River. I didn’t make it over there to see it up close and personal, but it was still pretty neat. Other oddities: I had my first “East Coast” foodie experiences on this trip. Awesome pasta and pizza, and even a pretty authentic Philly Cheesesteak sandwich, or so I was told by one of the folks on the trip who was from the Northeast. Yes, the pizza is pretty good this close the NYC. I was also startled when we stopped by the local Milford coffee shop our second morning there – I was sharing a car with four other folks from the PNW, so of course we we’re going to stop for good morning coffee – and saw Ray Troll artwork on the walls, and Raven’s Brew coffee for sale on the shelves. Raven’s Brew is a Ketchikan-founded, PNW-based coffee roaster that I really haven’t seen outside of Seattle and Southeast Alaska, and Ray Troll is a reasonably famous Ketchikan artist who’s distinctive work adorns the labels of most Raven’s Brew coffees. Talk about a small world – finding Ketchikan coffee in a small town in the Delaware River Valley. After returning to the PNW, the next few weeks were pretty busy with work related stuff, and a short-lived heat wave where the temps hit 100* F in Portland for a few days. There was a small lightning bust on the Willamette NF the last week of June that kept me pretty occupied, and got me a few hours of flying in a Cessna certifying an aerial observer for the zone. I have to say that the Willamette has some pretty gnarly country, as steep and nasty as anything I saw in Idaho, only with much thicker forests with bigger trees. I spotted a few lakes that I think I might try to hike into later in the year, or next year, and we even spotted few fires, which was what we were actually sent out to do. Sometimes the job can have some pretty nice benefits. Now, as July gets underway and fire season sneaks closer, I’m getting ready to make the move from Idaho to Oregon smack-dab in the middle of it all, which will probably prove interesting. In any event, life remains entertaining I suppose, and I’m scrambling as always trying to keep up. I think this month I was mostly winning, which is good. At the very least I went well beyond my 600-word goal for this month’s blog, and still didn’t really touch on everything that happened. That’s a sign of a full life I think… too full or not remains to be seen. In any event, I’m moving forward. This entry was posted in Personal, Wildland Fire. Bookmark the permalink.